This is demo 3 at my Florence workshop. Painting an old tractor was a lot of fun. I used this machine to teach perspectives. I like mechanical things. As a matter of facts, these a few days, my mind was not in painting. I bought an old camp trailer, so all my mind was all mechanical. I want to put the trailer on a off-grid land. Of course, it has opened a can of worms. This is my 2nd demo on my Florence TX workshop. I have enjoyed very much painting the water lily pads. Three days after I came back from China, I started teaching a plein air workshop at Florence TX. It was a raining day. Water fell on my painting formed perfect pearl like beads. I was heavily jet-lagged, mesmerized in the cool mist. But I like what I did that day. I want to thank Kirk Witmer and his wife for organizing this workshop and thanks to all the artists for coming and painting with me. My Hinckley workshop was arranged uniquely. First day still life, second day landscape, and third day portrait. This is my portrait demo. These a few years, I have not concentrated on developing my portrait skills. However, painting human is my true love. I hope someday I can have time working on anatomy systematically. I am confident I can be a good figurative painter, but I much across my own learning curve. I am behind in posting my workshop demos. So I need some time to catching up. Before I went to China in September, I taught a workshop at Hinkley OH. I have posted my first demo in August. This one was my 2nd demo on that workshop. I did this one from a photo I took at Easton. You might have remembered my plein air piece at this location. It was done almost all with a palette knife. I am very excited to announce that the well know artist Jove Wang will come to Austin next year. 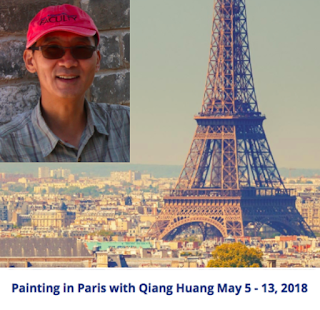 He will teach a 5-day portrait painting workshop on June 5 - 9, 2018. Jove and I met two years ago in Tucson. I saw his portrait demonstration on the Plein Air Convention. I really like his impressionistic style and his confident calligraphic brush work. Jove teaches intensively at his studio in California. It is a rare opportunity to learn from him is Texas. 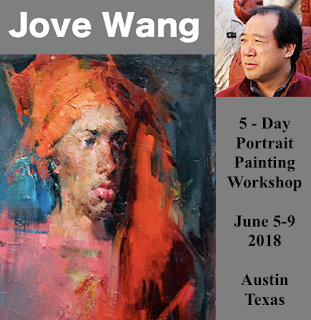 Please check Jove Wang workshop in Austin for detailed information, and sign up. After came back from Sedona, I have spent 5 painting sessions on this commissioned work. It is a 24"x24" from a photo I took in January at Ponte Vedra Beach FL. I am trying to paint more relatively large paintings. Recall a few years ago when I just started, I did so many 6"x6"s and 5"x7"s. It has taken me a few years to grow bigger. This painting was my last one on the Sedona Plein Air Festival. Instead of painting red rocks, I painted a group of yellow umbrellas. Sedona Plein Air was my 2nd time participating plein air painting festivals. I sold 3 paintings, and got two awards. I felt very satisfied. Most important, I have met quite a few wonderful plein air artists. It was a windy day. We were painting at the Seven Canyons in Sedona. I painted at a location call "Rachel's Knoll". I did my under painting wash with a very large brush. When I mass in my colors, I really like the transparency at foreground and did not want to disturb it. I touched a few small trees in the near field on the two huge transparent brush strokes, and left the painting alone. Very often, doing less is much better than doing more.